The most elegant and retired street in the town, as one eighteenth century writer described it, is named after Sir Nicholas Mosley, Lord of the Manor of Manchester at the turn of the seventeenth century. 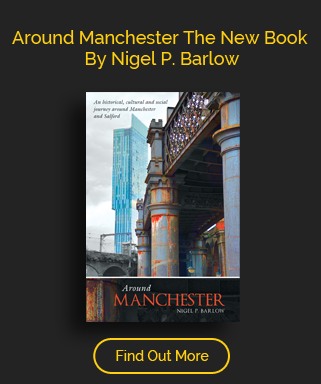 It’s origins go back to the sixteenth century, the first occupants of what would become Mosley St, says Thomas Swindell’s, lived in a few cottages, with gardens, and stood in the midst of fields. The area called Labrey’s Fold and stood where York Street crosses Mosley St today, the name Labrey came from Flemish Huguenots who had fleed persecution in their own country and brought weaving skills to the town. Opened on the 20th Jan 1806. 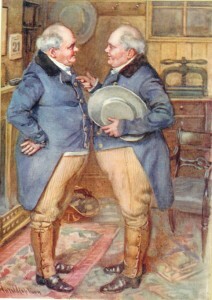 Mr Robert Robinson was considered the founder of the institution . He had visited Liverpool in 1796 and seeing its various institutions was surprised that Manchester being such a ‘ large and prosperous town ‘ had no newsroom and library. He didn’t give up introducing another scheme that saw that two guineas would be added to the subscription paid in advance until the building was completed enabling him to collect around £2000 and by now 360 had signed up. It was blessed with historical and topographical works as well as a large folio containing I’ve books of Valerius Maximus beautifully written on 431 leaves of parchment dated from around 1375 as well as large collections of the publications of various learned societies, amongst which were a first edition of Tim Bobbin, originals of Dr Byrom’s productions and the Adlington pamphlets, two hundred and eighteen volumes of political pamphlets including the works of Addison, Swift, Steele and Dr Johnson, all of which were collected by Mr C Legh of Adlington, said to be a man of various tastes and wide culture. Designed by Charles Barry at a cost of £9,000, it opened in 1839, it gave the architect the chance to experiment in the Italian renaissance style,Stewart, in his Stones of Manchester, called it palatial style, its origins being in the urban palaces of Rome and Florence contrasting with his Greco style for the building next door which he would also design. The Manchester Royal Institute. The Institute had been formed in 1823 at a meeting at the Exchange dining rooms and it was building new premises in Mosley Street. Joseph Aston looked forwards to describing the new building which will be the first place for an exhibition of paintings as well as for lectures in fine arts astronomy and chemistry as well as a theatre and a library. Gas lighting was fitted in 1838 and its six penny Saturday evening openings began in 1845 quickly becoming popular and soon allowing visitors access to its perms ant collections for a six penny ticket in a room formally used by the Choral Soviety. It would become the city art gallery, it’s entrance hall lighted from the roof, containing its principal staircase leading up to the first landing of the gallery, it’s interior adorned with casts of ancient sculpture including copies of the Elgin marbles presented to the institution by George IV. Other institutions sprang up in the vicinity, Manchester’s Geographical society started its life in Mosley Street at the house of James Heywood at the corner of St Peter’s Sq.Heywood was an early benefactor,giving one hundredpounds towards its set up and two collection of fossils.The museum moved into the Royal Institution in 1849 then to what became the YMCA in Peter St which was the premises of the Natural History Society before the whole collection moved to the newly established Owens College in 1873. Manchester Academy had started its life in Warrington in 1757, dissolved in 1783 but three years later a substantial building was erected on the west side of the street between Bond St and St Peter’s Sq. The academy opened with an address from its principal Dr Barnes, minister of Cross St Chapel, John Dalton was its Professor of Mathematics and Natural Philosophy. Barnes resigned in 1798 and in 1803 it moved to York,returning to the city in Grovsenor Sq in 1840 as the renamed Manchester New College before rerlocating to London in 1853 and hence to Oxford. 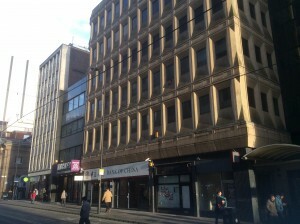 Its Mosley Street building was demolished in 1866. Manchester’s Independent Chapel was erected in 1788 on the corner of what is now Charlotte St, while The Unitarian Chapel also occupied Mosley St –its stood at the corner of Marble St, it had a Sunday school and small graveyard attached to it. The site was sold in 1836 and was cleared for the building of the Manchester and Salford bank, its new chapel was built in Upper Brook St. 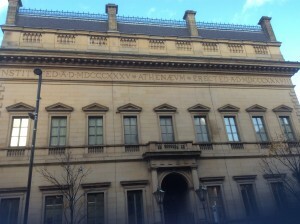 Opposite the Portico were Manchester’s Assembly Rooms. Opened in 1792, they were set up by subscription and housed among many facilities a ballroom, a tea room, a billiard room and a card room. 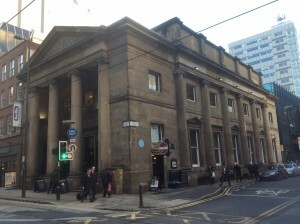 The ballroom would be the centre point of Manchester’s 1828 music festival along with the Collegiate Church and the Theatre Royal on Fountain Street. Its finale was a fancy dress ball for four thousand guests with the Theatre Royal, the Assembly Rooms and the Portico connected with a canvas tent thrown over Mosley St and part of Charlotte St, forming a series of supper rooms and saloons towards Fountain St. The site was sold in 1850 and warehouses were built in its place. The banker Nathan Meyer- Rothschild lived at No 25 which was at the corner of York Street. Sent at the age of 23 by his father from Frankfurt to purchase Manchester goods, he set up the firm Rothschild’s Bros on the corner of Lloyd St and Cooper St, though on his father’s death in 1812, he abandoned the Manchester business. Hugh Hornley Birley occupied the house at the opposite corner No 28 .Founder of the family dynasty, he is remembered for his part in the Peterloo massacre as Major of the Yeoman cavalry, later becoming first president of the Chamber of Commerce..
Mrs Mary Whitehead,daughter of the Calico Printer John lived on the opposite corner and opposite her Daniel Grant of the firm William Grant and Bros. whom Dickens would base his Cheeryble Brothers in The Life and Adventures of Nicholas Nickleby. Today the narrow and at times dark Mosley Street is a hotchpotch of architectural brilliance interspersed with some of the worst of twentieth century design. 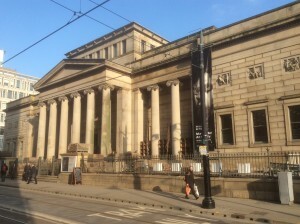 Some of its classical buildings survive, the Portico, the Royal Institute and the Athenaeum,now the City’s art gallery, Cobden House and Edward Walter’s Manchester and Salford Bank. bank of but where German bombs damaged buildings, 1960’s architecture has left a massive legacy. At the far end of Mosley Street stands St Peter’s Square. With so much building work going on as the Square is being currently turned into a transport interchange Plaza, it is difficult to ……..
Once at its centre stood St Peter’s Church, designed by James Wyatt, it’s foundation stone was laid in December 1788 and it was consecrated seven years later surviving as a church for just over one hundred years before becoming a victim of the falling population in that part of the city centre and being demolished in 1906. 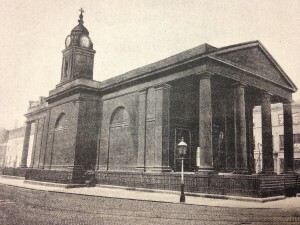 Less than twenty years after the Church was demolished, the site was chosen for Edward Lutyen’s cenotaph in memory of Manchester’s fallen of the Great War. Towards the end of the 1st World war Lutyens was appointed one of three Principal Architects to the Imperial War Graves Commission and would design over the next few years,The Great War Stone, Etaples Military Cemetery, the Memorial to the Missing and Cemetery in Arras, the Memorial to the Missing of the Somme at Thiepval and the Villers-Bretonneux Military Cemetery as well as both London and Manchester’s cenotaph. Manchester’s memorial was unveiled in 1924, a variation on the cenotaph theme, flanked by two obelisks and with one of Lutyens’ Great War Stones, an altar, in front. Under much controversy it was relocated in 2014 to the the side of St Peter’s Square as part of the work to accommodate Manchester’s second Metrolink crossing and enable more space to be opened up for public use outside Central Library.